On April 1, 1717*, La Concorde made its second attempt to leave France headed for the coast of Guinea. The trip was expected to be a long one; the first voyage in 1713 took eleven weeks to reach the port of Judas in Guinea (present-day Ouidah, Benin), and the second voyage in 1715 took fourteen weeks to reach Loango, in present-day Republic of Congo. The length of the voyage could be affected by weather, navigation error, attack from enemy ships, or stops for additional trade, resupply, or ship repairs. This third voyage of La Concorde was destined to encounter many of these trials. Two weeks in, on April 13th, strong winds and waves buffeted the vessel, pulling off its figurehead, and causing Jean Morel, one of the crew-members, to be thrown overboard. He could not be saved. Sudden violent storms were to be expected on the first leg of the trade route, but conditions for the crew were otherwise decent under the circumstances. 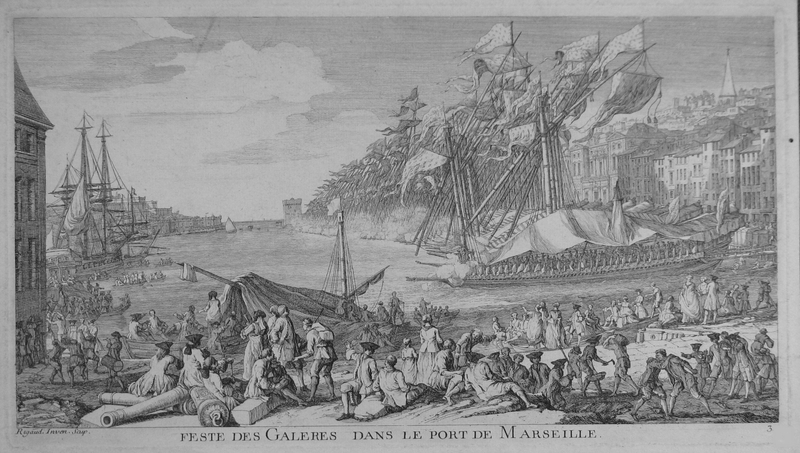 Many of the sailors in a slaver crew lived in poverty in France. While life onboard certainly did not promise comfort, health, or riches, it was a viable alternative for many. Each member received a daily ration of wine, meat or fish, vegetables, and fresh water, sometimes more than they could be promised on land. *The original French documents state the date as April 12. However, the French calendar in the 18th century differed from the English calendar by 11 days, and the date used here corresponds to the 18th century English calendar for consistency.